I ran out of cocoa recently and headed over to Draeger’s to pick up another can of Scharffen Berger (which I still love, by the way). 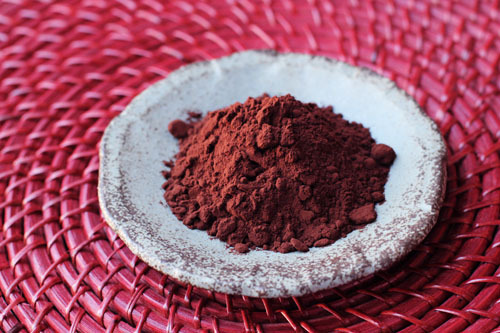 While I was there I spotted this Cocoa Rouge Cocoa Powder by E. Guittard. I decided to live on the edge, go a little crazy, buy something different. My friend Ana was over the first time I opened the Cocoa Rouge to make some mini molten chocolate cakes. Once the lid was off, we were both taken aback. 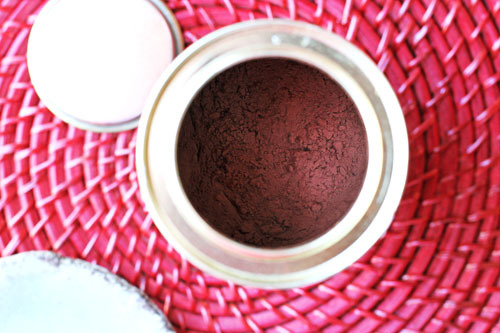 The powder is so rich in color, with red undertones. This cocoa is downright gorgeous. The loveliest cocoa I’ve yet laid eyes on. Great. Another expensive chocolate product to send us to the poorhouse. I just can’t help myself. If I were Mother Hubbard, my cupboard would be bare…except for some dang good chocolate, of course. I still dream about those lava cakes! Mmmmmm so rich and decadent!! This cocoa is phenomenal. And there’s no going back poor house or not! Actually, given the prices on their site it appears you showed amazing restraint! 🙂 looks *wonderful* — awaiting scratch ‘n snarf… Not a typo, scratch ‘n sniff is just not enough! Mmmmmm indeed! oh my goodness! this sounds heavenly!! sam’s used to sell Guittard chocolate chips. they were SO good, so if you see them try them. but now they don’t carry them and we can’t find them anywhere…sad day. i should look online! 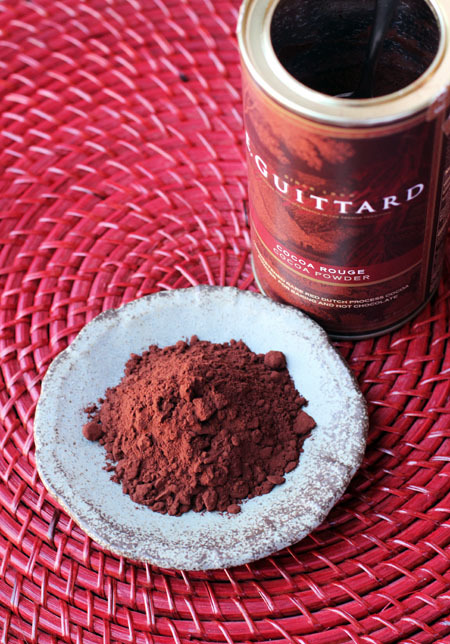 oh, Guittard are TOTALLY the chocolate chips I use. I love their super cookie chips – they’re big and flat, soooooo good in a cookie! I’ll have to keep my eye out at the bulk stores, would love to be able to buy them in bulk!! I’m going to buy that if I ever see it at a store. Thanks. I would love to try this cocoa, but I am actually totally addicted to the Double Dutch Dark Cocoa at KingArthurFlour.com! I buy this time and again, as it gives deep, dark, decadent, deliciousness to anything I use it in! This is from the oldest flour company in America, and their catalog, called The Baker’s Catalog, is a candy store for bakers. Have you been there, to the site? I LOVE King Arthur…and I’ve never tried their cocoa. I think that’s the next one to try to for SURE. so glad you told us about it! Will totally have to try this – looks so rich and colorful!